Our Cupcake Tower Tribute to the late President Cory Aquino was recently featured in an abs-cbnNEWS.com/Newsbreak article. The Cupcake Tower made by Mimi Ong, owner of Mimi Cakes, was one of several Cupcake Towers on display during the World Food Expo 2009. 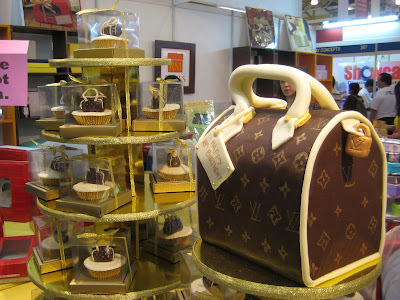 Other Cupcake Towers Themes on display were 'LV Bags' by Alma Bessie Vail of Perfectly Sweet Cakes and Pastries and 'Beach party' by Liza Imbao of Pink Apron. New colors of the Cupcake Tower, premium gold and premium silver, were also launched and examples of the different ways to decorate and use the Cupcake Tower were exhibited during the event.